What is it about global warming that makes so many normally rational people discard ration and start parroting nonsense? I normally read the Unambiguously Ambidextrous blog written by Raphael Alexander. And while I don’t agree with a lot of what he says, I can see how, based on his values, he arrives at his conclusions. In short he seems rational to me, even when I disagree with him. Unfortunately like many on the right his rationality is nowhere to be found when we writes on the topic of global warming. Notice how he immediately dismisses the mountain of scientific data that supports global warming or the conclusions of the IPCC the National Academies of Science from Australia, Belgium, Brazil, Canada, the Caribbean, China, France, Germany, India, Indonesia, Ireland, Italy, Japan, Malaysia, Mexico, New Zealand, Russia, South Africa, Sweden, the United Kingdom and the USA, the American Meteorological Society, American Geophysical Union, the American Association for the Advancement of Science, the Geological Society of London, the Geological Society of America, the Canadian Meteorological and Oceanographic Society, and thousands of peer-reviewed journals. Not to mention a recent survey of climatologists. Or the fact that no scientific body of national or international standing is known to reject the basic findings of the human influence on the recent climate. Instead he focuses on Al Gore’s movie, ignoring the science behind it. Again he completely ignores the science and just assumes that the reason for more dire prediction must be political. The real reason for the increase in dire predictions is a steady slew of scientific studies (published in respected peer-reviewed journals of course) showing that in some areas earlier estimates were too conservative. The melting of the arctic sea ice, the acceleration of sea level rise, the understanding of the effects of ocean acidification, of tipping points and of positive feedbacks are but a few examples off the top of my head. One wonders what evidence Mr Fielding hopes to get from Obama that he doesn’t already have access to. One also wonder why he is asking a politician for answers on a scientific topic. One might further wonder what would satisfy Mr Fielding in accepting global warming? If he hasn’t been convinced by the data already available to him, I wonder what would convince him? And why should we base the confidence of the science on convincing a politician who in all likelihood isn’t very science literate. For the record this is what would satisfy me that it isn’t happening or manmade. Failure to comply has left leaders looking weak, inattentive to science, and ultimately against the future of their own species. Such judgments are usually reserved for those who do not believe in a deity, not a scientific theory. Of course there is another explanation for why politicians who don’t accept global warming look weak and inattentive to science. It could it be because they are being inattentive to science, and are weak because they are unwilling to tackle this complex issue despite the overwhelming majority of experts in the field saying that the cost of action far outweighs the cost of inaction? And the fact that those costs will likely result in the deaths of hundreds of millions (some estimates are in the billions) it could be logically be seen that politicians that refuse to accept the science are acting in a manner against the future of their own species. Though I doubt it could get bad enough to wipe out the entire human race. 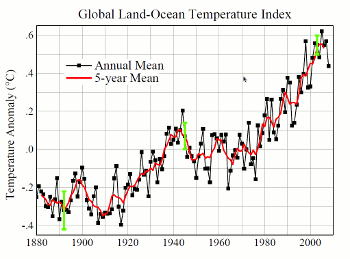 The fact is that the tide against anthropogenic global warming is quickly turning. This may be so, or not depending on who you ask, but despite what follows in Raphael’s post, the tide is certainly not turning against global warming in the one area that matters. Ah yes Inhofe/Morano’s infamous list. Unfortunately Raphael didn’t bother to look at the names on the list, or qualifications. If he had he would have noticed the lack of people with relevant expertise. Or perhaps that the fact that several people on that list don’t actually deny global warming. I am frankly surprised he didn’t mention the OISM petition, it has more names, and is equally as meaningless. But he is convinced by petitions then surely the Discovery Institute’s list of scientists who deny evolution will quickly change his mind on evolution. If not, why the double standard? Also claiming that Inhofe/Morano’s infamous list has more people on it than the number of authors of the IPCC is a huge misrepresentation of how the report was produced. The IPCC was reviewed by literally thousands of experts in the field, and based on those reviews a consensus was arrived at. Ignoring the whole review process twists the truth and will mislead people into thinking that the IPCC was the product of a small number of scientists. It isn’t. Raphael hasn’t read the IPCC, yet he feels he can opine of whether or not it is full of rampant speculations and fearmongering. I want to know exactly what part of the IPCC Raphael thinks is rampant speculation? And what part is pure fearmongering? Did they misrepresent the research they cited? Did they leave something important out (remember the deadline for submitting research was well before the 2007 publication date)? And if so then why does pretty much every relevant scientific society agree (a few still have non-committal statements) implicitly or explicitly with the IPCC conclusions? If he had any idea of the process involved in generating such reports he would understand that such reports are inherently conservative. But instead he decides to rely on the denialsphere’s misrepresentation of the IPCC to form his opinions. No wonder he gets it completely wrong. Temperatures have levelled off on the globe after having risen in recent decades, and been relatively stable since 2001 despite the growth of CO2 in the atmosphere. Well at least he didn’t use 1998 as a baseline. But unfortunately he used an even shorter time scale. I wonder what he thinks all of this means? In regards to climate change it is absolutely meaningless. What makes this even more humorous that according to NASA GISS 2005 was the hottest year on record, and the 2000s are on track (with only a few months to go) to be the warmest decade ever recorded. I wonder why he didn’t mention any of those statistics? Ok enough science, back to politics! I am not going to bother to comment on the absurd comment that follows about “It may be that the hysteria involving global warming is not dissimilar to the AIDS pandemic, disproportionately attributing every death in Africa as being a result of the disease”. It speaks for itself. Governments around the world have said that polar ice cap fluctuation, hurricanes, diseases, and forest fires are all related to the ubiquitous “climate change” monster. Shockingly, it’s a load of nonsense that even our federal government in Canada seems to have swallowed. I am sure it wouldn’t be to much trouble to find instances of politicians overselling the science (attribution is tricky, and full of nuance that can be lost on politicians), the fact is that there are scientific studies linking all of these phenomenon to climate change. Why support a theory that isn’t proven? Well for starters one could look at the definition of a theory: a well-substantiated explanation of some aspect of the natural world; an organized system of accepted knowledge that applies in a variety of circumstances to explain a specific set of phenomena. Seems like a reasonable thing to support. I especially like the part about a theory being well-substantiated. In science nothing is proven. What exists now is a theory that is supported by a vast amount of evidence, with a good prediction ability (by hindcasting) . In other words the only way to improve on our confidence is with replication, but obviously that isn’t possible. So what we have now is about as good as it gets. I’d say that is reason enough to should support a theory that isn’t proven. Of course we accept all sorts of theories that aren’t proven, such as evolution, the link between cigarettes and cancer, gravity, general and special relativity, and all sorts of wacky theories from the world of quantum physics. Why would climate change be any different? I never thought I would see the words populist and carbon-tax in the same sentence! And the longer that people have to wait for a doomsday that never arrives, the greater that backlash is going to be against that scam. The doomsday that has been predicted (if you bother to read the actual science) is one that comes gradually and who’s effects wont be really felt for a while (exactly how long is a matter for discussion, I have seen estimates as early as 2025 and as late as 2150, though some more mild effects are already here). I am not entirely sure what kind of doomsday Raphael was expecting or when he though it would arrive, but I hope he hasn’t been holding his breath! The basic problem people like Raphael make when looking at the climate change issue is assuming it is a political issue, and treating it as such. Every new claim must have some political motivation, every scientific report from respectable organizations is treated the same (or worse) as reports from un-reputable, decidedly non-scientific sources. In short Raphael is trying to provide balance to the issue. Unfortunately science isn’t about balance, it isn’t about competing viewpoints, it is about data and the logical conclusions that can be drawn from it. This problem is made worse by the fact that his misconceptions run so deep that he fails at his attempt to provide balance ands end up simply parroting nonsense. Science should never be treated like politics; the two are different animals altogether. UPDATE: This seems particularly appropriate right about now. To me, the short explanation that conservatives are so dismissive of AGW is that they just cannot believe that something so ‘wonderful’ as capitalism could be in any way responsible for it. It has to be a ‘real and present’ threat (like a war) rather than just ‘far off speculation’ (i.e. not real, cannot be real). Anything that puts limits on their personal wealth and freedom either has to be real, or it simply is not. Certainly that is part of it. But I don’t think it explains everyone. For some it more of a reactionary response to the fact that in general the left has accepted the science. To them the fact that the left says it is a real threat means that they automatically do not. For others it is the fact that most right wing leaders do not accept the science. For others is it an inability to distinguish between real science and junk science. And for most deniers it is a combination of all of the above.